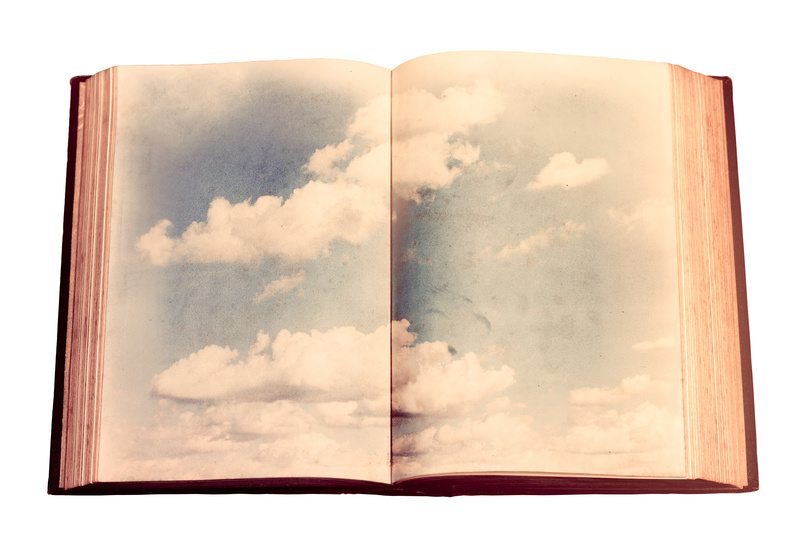 I long for my name to be written in a book with clouds in the illustrations. I long for my name to be written in an ancient book, a book before I was, a book that knows all about me and promises me an everlasting last chapter more beautiful and more delightful than I can imagine. I long for my story to be without the evil twists. For my sin to be brushed away like cirrus clouds and the cumulus clouds of joy to be bustled in. I long for a life far beyond what I live now. I long for a life with God. The trouble is, I am afraid for that book to open. Because I know it means the end of my life as I know it. It means my death. As much as I want the storybook of promise that Jesus offers through His sacrifice . . I am terrified to open the covers to see whether my name is really inside. I’m afraid that I’ve misunderstood, that the offer was really for less evil people, that I didn’t believe enough, that I failed the test, that I missed it by one ‘good deed’. I’m afraid to die. I’m afraid that, when I die, I won’t have enough to show for my life. I’m afraid of my name disappearing from the most beautiful place of all: the Lamb’s Book of Life. He is my story book. He is the Author of the Book of Life. And He writes the names there not by their perfection, but by His. I believe in His perfect life. I hold onto His quintessential story. I live in His happily ever after. I bask in the hallelujah that I don’t have to be afraid to die. And I happen to know that His book goes on forever and ever in the best possible way. The wall was made of jasper, and the city was pure gold, as clear as glass. The wall of the city was built on foundation stones inlaid with twelve precious stones: the first was jasper, the second sapphire, the third agate, the fourth emerald, the fifth onyx, the sixth carnelian, the seventh chrysolite, the eighth beryl, the ninth topaz, the tenth chrysoprase, the eleventh jacinth, the twelfth amethyst. The twelve gates were made of pearls—each gate from a single pearl! And the main street was pure gold, as clear as glass. When the Sherman Brothers previewed all the songs they had composed for the making of Mary Poppins, Walt Disney chose one song to represent what the musical was all about: Feed the Birds. Not what would later be the famous Supercalifragilisticexpialidocious, nor the award winning Chim Chim Cher-ee. It wasn’t what would become a catchphrase Spoonful of Sugar or the uplifting Let’s Go Fly a Kite. Rather, it was the somber Feed the Birds that won the primary attention of Walt Disney. For Disney, the song captured what he thought the movie was all about: doing something small (like giving a tuppence to feed pigeons) to make a huge difference (like supporting an elderly woman). Disney wasn’t the first to come up with this idea. Throughout the ministry of Jesus, you get this very same thought. After all, Jesus taught that God would remember who gave even a cup of water to a suffering believer out of love for Jesus (see Mark 9:41). He blessed children, who in that day weren’t always so valued (see Mark 10:16). As a friend pointed out to me recently, Jesus’ purpose for coming to earth wasn’t to heal people, and yet He took the time over and over again to do just this. Even though He came to save us from our eternal sins, He took the time to heal us of our temporary sufferings. Time and time again, He healed those who came to Him with all manner of sicknesses. He even took the time to protect a bride and groom from the embarrassment of running out of refreshments! As a Christ-follower, it is my job to take time out of my day to “feed the birds”: to bless the lives of those around me by Christ’s compassion, kindness, humility, gentleness, and patience (see Colossians 3:12).